Welcoming a Little Girl in Style! 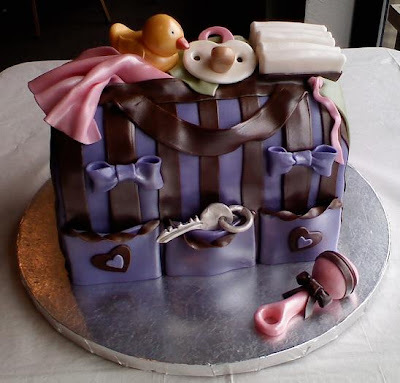 This cake was made for a baby shower. The cake was big enough to feed approximately 40 people, so it was a good size- even though it looks pretty small in the picture! Every detail was hand-made out of fondant. This is a double tiered cake made up of 8-inch and 10-inch tiers. It's covered in a layer of buttercream and then fondant. The animal pieces are also made in all fondant. Close up of the tree complete with toucan! This is a collage of the four sides of the bottom tier. Each animal was hand cut from fondant. The quality of the pictures aren't fabulous because of all the cropping I had to do. See, it IS okay to play with your food! This cake was made for another very special birthday- our cousin Dominic's 21st! The game station was made as close to scale as possible and is covered in fondant. The remote control is also edible and made of cake. This cake was made for a very special little guy- my cousin's son Liahm. I was lucky enough to have been able to make her baby shower cake (Snakes and Snails) and can't believe it was already time for the Christening! It is a two tiered fondant cake made with 6 and 8-inch tiers. It was airbrushed in a shimmer paint to add the sheen. This is Liahm enjoying his first piece of cake- he dived right in (after he inspected the frosting on his hands)... So CUTE!!! This cake was made for an 80th Birthday. Unfortunately, most of the pictures of this cake were accidentally deleted on my camera. Luckily I do have one remaining picture and it happens to be the close-up of the bagpiper which was hand-made from fondant and came complete with fresh flowers on top. This cake was two tiers covered in white fondant with white fondant swags draping down the side and also red plaid ribbon on the bottom of each tier. This is a 10-inch double-layer cake with buttercream frosting and fondant details.